Welcome to the JVNP 2.0 Update featuring a primary JV request courtesy of fellow JVNP 2.0 Partners Cecil Robles, John Halpin + Joseph JV Varghese (Bitcoin Mentor Club high ticket launch affiliate program JV invite), Buzz Builders (Nisandeh Neta – The Smart Business Success System launch), and More … in Today’s take advantage of Bitcoin & Cryptocurrency popularity with this proven to convert promotion edition. Right now there are MILLIONS of dollars in sales being generated in the HOT and ever growing Financial Publishing Niche … … and the hottest “sub-niches” in this space right now are Bitcoin and Cryptocurrencies. You can’t turn on the news or look at your Facebook feed without the topic “hitting you” right between the eyes. Our team, including legendary financial publisher and copywriter, Cecil Robles, have put together a funnel that is nothing short of “amazing”. * Optins averaging 62% across the board. * EPCs (for affiliates) averaging $5.79. * Crypto popularity and acceptance soaring into the stratosphere! * Lifetime “first in” cookies. * 50% commission on every sale in the funnel. * 7 (SEVEN) day payout of first 50% of commission (must be approved). * Offering course payment in BTC (with discount to buyer!). 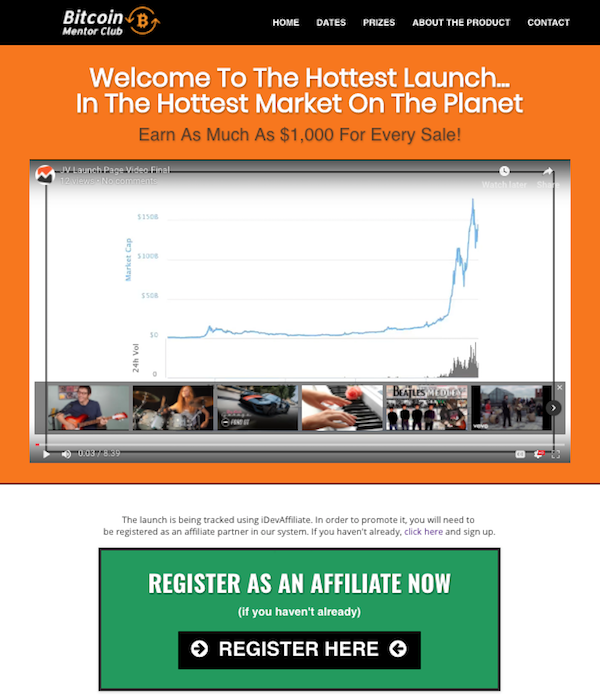 * Earn As Much As $1,000 For Every Sale. You may have recently heard that one of your other friends/partners in this space did a webinar last week and grossed ELEVEN MILLION dollars in just 2 hours! Get REGISTERED HERE right now! JV with Han Fan & “The Voice Trainer to the Stars”! Videos, speeches, and presentations convert primarily on the basis of the CONNECTION the viewer has to the speaker. There is a SCIENCE TO SPEAKING and you can learn it from Arthur Joseph, legendary Hollywood VOICE TRAINER TO THE STARS and communication strategist for some of the biggest names in Hollywood, Sports, and Broadcasting. Han Fan – Visual Voice Pro 2.0 Launch affiliate registration page. JV with the Trainer, Coach & Mentor of over 150K Entrepreneurs! The Smart Business Success System. Proven step-by-step business system developed BY entrepreneurs FOR entrepreneurs who want more freedom, wealth and fulfillment. Made $20MM+ in Holland. Available online starting Nov 15th. Commissions 40% for all JVs, already-made media kit. All you have to do is click “send”. Become our JV today (Free indiegogo.com account required in order to participate). Nisandeh Neta – The Smart Business Success System JV page. Reed Took Notes, Feverishly, for 2 Days so that Your Audience could Learn eCommerce for a Fraction of the Cost … and YOU get the Commission! Your customers will learn eCommerce from: Karl Schuckert, Chase Bowers, Ben Malol, Frank Keeney, Lowell Rempell, Travis Petelle, Rob Burns, Rob Fajardo, Ron Lynch, Thomas Bell & Rich Wilens. This will be sold at $17-$27 on a dimesale and you’ll earn 50% commissions. Upsell: Zero2Scale Videos/Audios/Transcripts – $297 – 50% commissions. Downsell: Zero2Scale MP3 Recordings – $47 – 50% commissions. Reed Floren – Zero2Scale Seminar Notes JV page. $9.81 EPC … Interested? MASSIVE Video Launch! 27 Best Sellers Launch. Flicks that are magically addictive! Earn Up To $435 Per Lead. $9.81 EPC. 23% F/E Conversions. 87.1% OTO Conversions. 50% commissions 4 funnel deep. $12,500 JV Contest & Cash Prizes, 30+ swipes & more details here => Brett Ingram + Mo Latif – Flicktive JV page. Imran S, Jamie Lewis, Travis Stephenson, MindValley and other fellow JVNotifyPro 2.0 partners are waiting in the wings … keep your eyes on your Inbox, and follow the action in the JVNP 2.0 Premium VIP JV Announcement archives.